Synopsis: When it comes to love there’s no such thing as conventional. They started as childhood friends (Lilly had to babysit Colton, even though he was only a year younger), so it's not instalove at all, which I loved. :D After a nearly 10 year gap of not seeing each other, Colton suddenly appears at Lilly's school as a art prodigy. He was always good at art, and he was always colouring at the sittings. And Lilly, even young as she was then, was a funky spunky girly who couldn't sit still. So of course poor down to earth baby Colton had to watch and run for help while she got struck by lightning after deciding to play on the metal slide in a thunderstorm in one babysit session, cut gum out of her hair for her, watch her get a concussion after sliding down the stairs on a mattress because well… “I decided to show him exactly how much fun it could be. I got onto the mattress backward, staring him in the face as I pushed off the top stair and started to head backward down the stairwell. Except… the mattress didn’t come with me. Not at first anyway.” At this point I was really just facepalming and trying not to laugh, even though it wasn’t a relatively funny scene XD But in my defence, I started at 2am and finished at 3! so ha. I was bound to be a bit delusional. Lilly is still like that now, but a little less. Colton's mum: "Lilly Evans." The way she said my name made my nose scrunch. I said hello and she laughed, her head thrown back and reddish hair bouncing. "I didn't think you'd make it to sixteen... much less your senior year." Touché, Mrs. Neely. One point for you. Colton. Ughh he's so sweett! "She's paint by number; you're a watercolour." "You're my beautiful Lilly. The one who makes everything right in the world." So Colton and Lilly, yeah? They’re just so..perfect ermahgosh! Lilly helps how to fit more comfortably into social society, and in turn, Colton shows Lilly what love really is. "I dream of you. And I don't like it when I can't talk to you or see you or touch you." His eyes found mine again. "That's love." Boys were fun, but they were more fun to hang out with. Amber L. Johnson really is a very talented writer to put all that emotion and love and character development into just 126 pages. Even 500 paged books don't always succeed at that. I really loved itt! In short, it was a veerry short but beautifully magical hilarious predictable read that I read in one sitting in the middle of the night. I would definitely recommend it, and if you didn't like it, no harm done because it's only 126 pages longg! *shoos* Go go. 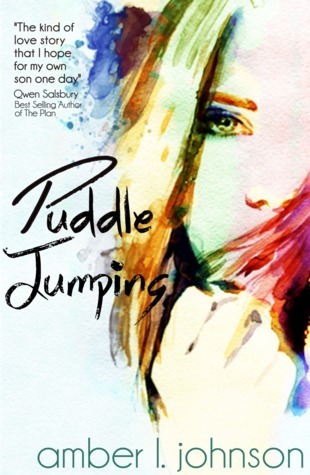 He grabbed by hand and started to run, jumping over puddles as we raced back to his house.